Assets are lost all the time in medium or large companies, either from employee neglect or dishonest intentions, which leads to extra expenses for replacement equipment. 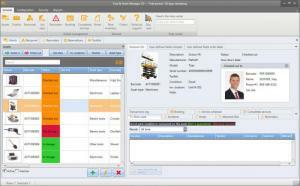 Tool Asset Manager can help you keep track of individual pieces of equipment, employees and more. You can organize physical items in a database so that you will always know the whereabouts of each item and ensure some accountability. This way, you can make sure your employees or co-workers are more careful and cut some significant losses. The application is free to try for a limited time but without any significant functionality restrictions. It has a small setup file, and its components can be installed in under a minute, without any difficulties. You don't have to install any special tools or services, and you don't need powerful hardware to run this program. The program lets you create database entries for tools, employees and other assets, and use them together to create a comprehensive tracking system. You can specify a wide range of details when adding an asset to the database, including its type, manufacturer, model and serial number. Additionally, you can organize them in categories and sub-categories. For example, you may create one or more toolboxes, with specific assets, and assign them to a truck. However, a more important feature is the possibility of assigning individual assets to employees, so you will always know who has a specific tool, what job they're using it for, and who to hold responsible if it goes missing. Everything can be organized on tabs, on the software's user interface, and it mostly involves filling in input fields. You can make countless specifications about each item and add pictures as well. The best part is that each type of database entry can be assigned one to another. You can check out one or more tools and specify the employee who took it out, as well as the job sight they're working on, and it only requires a few clicks. Besides assigning items to people and work sights, the software can help you with other aspects of your business as well. For example, you can schedule maintenance inspections for your tools, get notifications when the event is getting close and mark them as unavailable when you send them out. Asset booking is another feature you will find useful. It gives you the possibility of assigning assets to employees for a future date, so there won't be any mix-ups when someone needs a tool for a certain job, and it's all thanks to this simple utility. There is a lot you can do with Tool Asset Manager when it comes to organizing your company's assets. You can organize any assets in a database and assign them to employees. The software can help you keep track of tools, people, job sights, and more. It lets you book assets for employees, and it also provides notifications when an item needs maintenance. There are no serious issues to address. You can download Tool Asset Manager free here.